Passengers can experience THAI’s award-winning service, with a distinctively serene Thai style all the way to Australia. 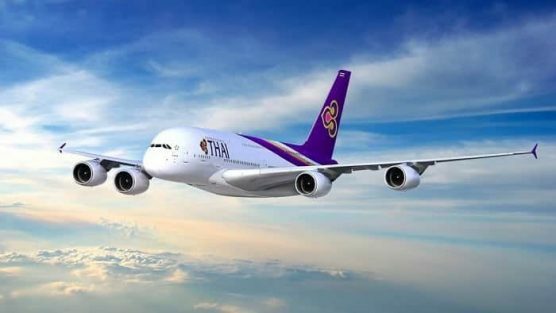 Thai Airways operates state-of-the-art Airbus A380 and the Boeing 777-300ER on its twice daily service from London Heathrow to Bangkok. The onwards flights to Australia are served with the latest aircraft – the Airbus A350 to Melbourne, the Boeing 787 ‘Dreamliner’ to Brisbane and Perth, as well as retrofitted Boeing 747s to Sydney. Fares start at Sydney from £717pp, Melbourne from £708pp, Perth from £701pp and Brisbane from £717pp. Passengers can sit back and relax in an award winning economy cabin with comfortable ergonomically designed seats, where all of their needs are anticipated and the service comes with a smile, from boarding to the final destination. Thai Airways Economy Class meals are crafted using the best produce to ensure freshness and quality, and it’s on board catering was awarded the best in the world by Skytrax in 2017. Entertainment is on demand with hundreds of hours of movies, games, music and TV shows. Passengers in Economy Class are also entitled to a generous 30kg baggage allowance. Royal Silk Class is Thai Airways’ Business Cabin. The Royal Silk experience begins before take-off, where passengers receive fast tracked prioritised check in and baggage handling and access to wonderful lounges. The Royal Orchid Spa in Bangkok Suvarnabhumi airport is award winning and Thai Airways Royal First and Royal Silk Class passengers can enjoy complimentary massages whilst waiting for their connecting flight – what a great way to unwind after a long flight! Passengers flying in Royal Silk enjoy a fully flat bed, fantastic cuisine, using local Thai produce from the Royal Projects organic farms and a vast array of on demand entertainment; you might not even want go get off the plane! Frequent travellers can earn points with the Thai Airways Royal Orchid Plus frequent fliers programme, and also on its Star Alliance partners – THAI is a founding member of the world’s largest airline alliance. If you are looking for a stop-over in Thailand, Brightsun Travel has some exclusive hotels rates and can put a fantastic package together for you! Brightsun Travel has been in the travel industry for over 30 years, are ABTA/ATOL registered and can help you get some of the best air fares on the market. They sell holidays, flights, travel insurance, can arrange your transfers and car hire and are open 24/7.